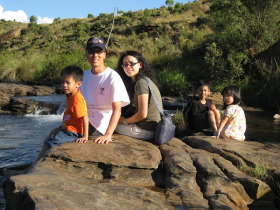 Florence and Paul Chong travelled with their three children from Toronto, Canada to South Africa in March 2012. For two weeks, they exposed themselves to life on the other side of the world. 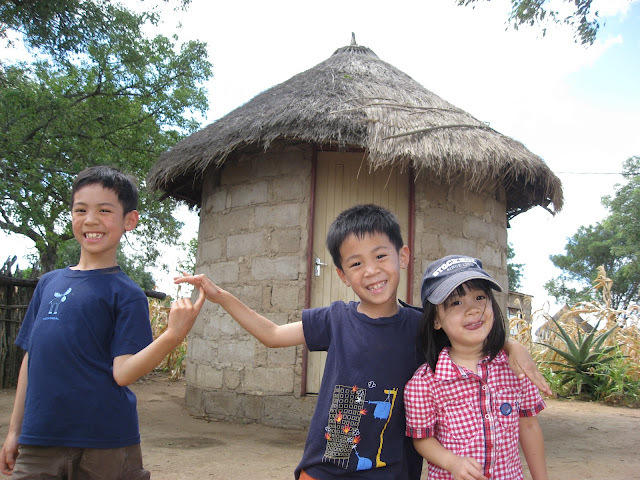 Here Florence Chong reflects on "the best experience they have ever had as a family and as individuals." The Chong family's relationship with Hands at Work was sparked by the eldest of their children, 8-year-old Nathan Chong. Nathan decided that, in lieu of gifts for his birthday, he would raise support for orphaned and vulnerable children in Africa through Hands at Work. He raise $300 CAN for the organization, but not just that, he inspired his family to make the trip to South Africa to see the results of his efforts for themselves. We had never thought about going to Africa, not even for a vacation. We had always financially supported missions in Africa, but we thought that going there was for the called passionate few. Then God moved us by using our 8-year old son Nathan. It started with Nathan's 7th birthday party. Instead of receiving gifts, he raised a small amount of money for Hands at Work. From there, God led us into a friendship with Hands at Work. 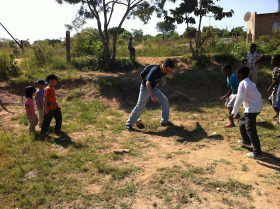 Eventually, God prompted us to take our three children, aged 3, 5, and 8, to visit the Hands at Work Hub in South Africa. Initially, we were hesitant, but God was increasingly clear about His intentions. We knew we’d better obey. 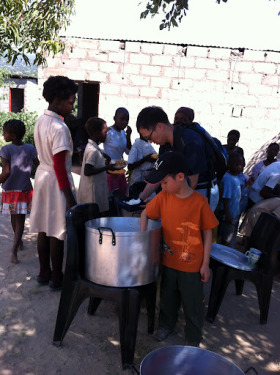 Caleb Chong, 5, helps local caregivers with serving food to this community's most vulnerable children. What we thought was a small step of obedience turned into the best experience we have ever had as a family, and as individuals. God has touched each of our lives in so many ways that we could not have asked for anything better. Upon arriving, we were expecting to see a lot of miserable children – but we ended up being infected by their smiles and fun-loving nature, and were in awe by the joy and hope we saw in many of them, even in the midst of great suffering. We were inspired by a few orphaned teenagers who strived to live under the Lordship of Christ and to pour out their lives to help other younger orphans. We had wanted to help our own children understand poverty, but we ended up understanding a lot more ourselves and have developed an appreciation of the values, model, and approaches that Hands at Work is taking. It started to make sense after a few walks in the communities and witnessing the eagerness and joy of the volunteer caregivers in reaching out to their orphaned neighbours. We imagined if Jesus was there He would do exactly the same, walking from door to door and seeking the marginalized and the poorest of the poor, then sitting down beside them on the ground. We realize lives can only be impacted one at a time through relationship building, and every one of those lives matters greatly. Paul Chong bonds with the local children.We went there expecting to contribute ourselves; we ended up with tremendous admiration for the caregivers and being humbled by those who volunteer with Hands at Work. We learned about the beauty of compassion from a caregiver - herself a widow - who knelt down beside two widows who had just lost their husbands. We learned about servanthood from the caregivers who faithfully walk the same path, five days per week, to visit the sick and the needy, just to hear about their lives. We learned about giving from a volunteer who, year after year, participated in mall contests and donated all her prized money to the community, when she could have used the money to better her own life. We learned about self-control from an orphaned young man who resists bad influence and alcohol in order to live a life of obedience to God. We witnessed helplessness and loneliness in the eyes of an 18-year old boy who lives alone after his mother died and his father ostracized him - his only companion being a small doll by his bed. And we learned about fellowship from living in the midst of the Hands at Work family, and sharing in their burdens on a daily basis. To read past posts about Nathan and his story, click here.